The secret to Victorinox is the spring. The invention of the floating spring and construction that can operate three functions at the same time is the key. 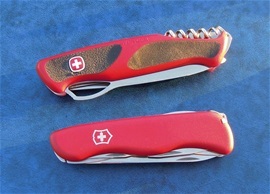 This is implemented during the complete history of the Swiss Army Knives from 1897 until today. The pioneering feats to make a stainless steel that could be hardened was an advanced process in it time that fulfilled the continuation of the product quality. During the complete history of Victorinox the precision and quality develops. The secret to the quality is still today the spring in my opinion. On larger Swiss Army Knives or Victorinox products the design and spring must be enhanced. This means the obvious that a larger and heavier blade must have a stronger support and operating guide. In one way a tool designed for harder tasks must have a locking mechanism. This must be present if the comfortable use of the blade shall be present. If not you would need a much harder and stronger spring to avoid accidental closing. Correct use of any knife involves using a knife like there is no lock at all. As said a larger blade must have a locking mechanism unless it could be difficult to have a comfortable use. 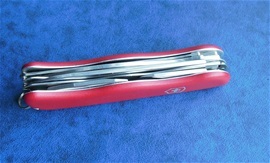 The Victorinox slip-joint spring is specially developed with its design to hold the blade in open and closed position. The lock is just there as a back-up for preventing accidental closing. The advantage with versatile knives is to have several functions in one package and this involves locking mechanisms. The construction used on the 111mm services range is always worth looking closer on and in my opinion it is artwork. It is a very intelligent design and the result of the history from 1884 until today. The Swiss Army Knives and multi-tools are today the modern knife that is designed to be very useful for the world. It is not possible to say that fixed blades are the only knife. In my opinion both are necessary today. The Victorinox philosophy in versatile 111mm knives is obvious designed by tradition but also innovation with constant quality development. It is a time window and it is an image of the modern need in knives. There is always a balance between functionality and comfort. When a tool is designed for a bit harder tasks this involves an implemented safety with a lock. Without this then a knife would probably not be considered comfortable anymore and the functionality would not be Swiss. It is unavoidable to not have locking mechanisms on larger SAKs. It would be a safety risk and by todays standard it would not be able to fulfill the services need or the outdoors person demands. The Swiss Army Knife spring is one of the most advanced in the world. It can operate more than two functions at the same time. So when Victorinox developed the spring to be implemented into the sturdy 111mm line the dimensions had to be enhanced. It must have a spring tension that follows the longer and heavier blade. It must be able to take the forces working during use without collapsing. During use on a longer blade you get a tool designed for larger tasks and the longer edge can during cutting get stuck into the material. When backing out of a cut you can fold the blade over the fingers. In a way it is smarter to pull the blade out when “force cutting” on wood for example. Without a locking mechanism you would have to have in mind all the time to avoid this and this would influence the safety and comfort. Because you have a thicker and longer blade and edge you enhance the danger of getting stuck in a material. This means simply that a locking mechanism must be there to avoid this problem. During cutting for rescue tasks the belt cutter is best suited with a lock and this got three main reasons. 1 is the safety for the operator and the person stuck in a belt. 2 the comfortable and fast cutting performance and number 3 is the confidence. The construction on the 111mm services range involves the same philosophy with a spring that can operate three functions at the same time. The larger flat screwdriver got a locking mechanism for all the same reasons for functionality I have mentioned. The main blade got one spring and one function on the Fireman with a locking mechanism. It does not have one hand opening. The best today is one hand opening as well. A longer edge must have a stronger spring and this Victorinox managed to do in a way with a comfortable operation. A said because it is a longer edge you must have a lock. It is longer and heavier and you get the possibility of cutting more material at the same time. The danger during force cuts is when backing out of a cut. The 111mm liner-locking construction got large functions. It allows a long blade in a sturdy sandwich design. The liner-lock is a cut part in a stainless steel liner that at the same time gives stability to the blade and complete sandwich design. The construction got thicker rivets and stronger springs. Victorinox or Wenger knives are under no comparison with spring assisted knives. That said many spring assisted knives are in my opinion excellent safety knives in the outdoors. For people with less mobility then these are very useful as well. 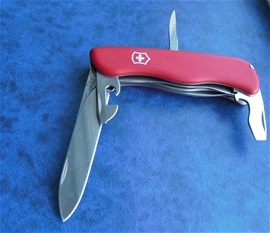 Swiss Army Knives by Victorinox and Wenger are considered slow “one hand opening “blades that require a physical mechanical movement with the thumb to open the blade. The spring works against you when you open the blade. I have no interest in knives for fighting, that said I would like to say that spring assisted knives are not the fastest opening blades at all. The fastest is the person that operates a one hand opening blade. I trained to become faster than any one hand opening blade out there that got assisted opening. I do believe I managed this because I do it for all the correct reasons. My brain works extremely fast and my body responds to the direction. I do not like knife abuse in any way and for we SAK people we are interested in tools. It is for all the good reasons. On the picture on the right are two knives that i know everything about, the Wenger 130mm New Ranger Grip 79 and 111mm Fireman. Locking mechanisms must be present on larger SAKs.. Thank you for following me today folks! One of the advantages with the Swiss construction is the precision of the spring. The forces working on the joint between the tang and back of the blade vs. the spring can be formidable. During force-cuts the precision of the blade and spring must be 100%. The dimensions on the spring must follow the cutting tasks intended. It is the precision and material tolerances between the blade and spring that prevents collapse. This spring must also be the guide for the opening and closing of the blade. Victorinox made an impregnable spring that will be able to open and close an extreme number of times. It is designed perfectly with contact points towards the blade. The locking mechanism is the backup of the design and construction. It will take much more compared to the slide-lock design. The dimensions of the rivets, spring and contact areas at the blade tang must have precision and correct design. There are more factors as well and that is during force the spring must not be pushed backward in a way that compress the steel. This will destroy the functionality of the knife. The spring may therefore have a center rivet that prevents the spring being pushed back. The spring must be designed to take the forces working there too. On the fireman there is also a second center rivet that is open to see. There is a design on the spring that rest against it and at the same time next to it another design that act as a stop for the blade in rest closed position. Wenger and Victorinox has really understood the spring! The precision on the slip-joint spring is by far the most important for this large blade and the little play against the lock may be unavoidable. It is designed so and as said it is only there as a backup. Last today i would like to talk some more on the flexibility and elastic region of the spring. The spring is impregnable and it must be able to handle all the factors mentioned above. There is flexibility in the spring when you open and close the blade. There is also some flexibility when the blade is fully engaged. There is what I believe is the elastic region of the complete spring and design as well. Stay strong and keep your edges sharper! A SAK need some maintenace from time to time and if you keep the edge sharp at all times you will preserve longer lifetime on it.